Posted March 5, 2014 by Will (Chief Information Officer) . Like most things in life, there is a right way and wrong way to do marketing. 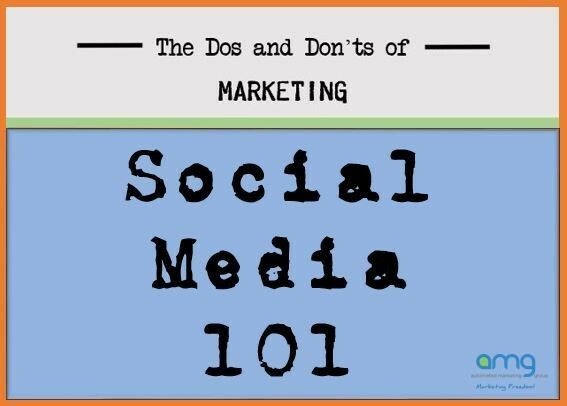 Over the next few weeks, our team is going to be sharing our thoughts on some of the most important dos and don’ts of marketing for your small business. 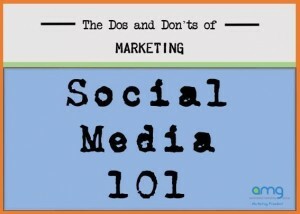 In our first segment, we would like to let you in on our top 5 dos and don’ts of social media marketing for business. Post often but don’t go overboard: Posting to your pages on a regular basis is essential for social media success, but be careful not to overload your followers’ news feeds with too much information. Doing this could cause your customers to stop following your posts or even block you. Always respond to your customers: One of the biggest mistakes businesses make on social media is asking for a response in posts and neglecting to acknowledge customers when they follow through on that request. If you want people to interact with your business, you have to put in the time and effort to monitor your accounts and interact with customers when they engage with you. You wouldn’t ignore a customer asking you a question at the front counter, right? That same level of customer service has to be applied to your social media marketing. Give your fans something to be excited about: Adding a little competition to your pages can be a fun yet effective way to gain new followers and increase fan engagement. Try out a Facebook Sweepstakes or a news feed contest to see what will work best for your audience. These types of campaigns are also great opportunities to work with other local businesses and connect with their followers. Analyze your results and plan ahead: No two businesses are alike when it comes to social media. You have to know your audience and understand what YOUR customers want to hear from you. One group of followers may prefer to receive educational and informative content, while others love to see the humorous side of your personality through funny videos or memes. The better you know your audience and measure results, the more you can plan ahead to create a successful marketing strategy. Set realistic goals and expectations: There is no magic bullet or quick fix to becoming the next Guy Kawasaki or George Takei. It takes time and commitment to build an online community for your business. Instead of aiming for 1,000 likes right out of the gate, set smaller and more realistic expectations to build a pathway to long term success. Doing this will keep you and your team motivated to reach that next milestone. Don’t be spammy: Always remember that the purpose of social media is to be social. Focus your content around starting a conversation and try to avoid talking about yourself too much. Filling up your customer’s news feeds with promotions or discounts is a great way to cause customers to unfollow or block your page. Posting the same information too many times can also lead to your page being flagged for spam and shut down. Instead, post stories or ask questions that they can relate to. Tips and tricks are also a great way to show expertise in your trade. Don’t like your own posts: This one is pretty straightforward. Of course you like the post – you are the one who wrote it! While you should be proud of your creation, liking your own content is not going to increase your reach or engagement. It is best to leave the likes and shares in the hands of your customers. Don’t forget to interact with other pages: Social media is not just about connecting with customers. It also serves as an excellent tool to network and build relationships with other brands and organizations. Do this the right way and you could end up with more word-of-mouth-marketing than you ever planned for. Don’t define your success by the number of likes/followers you have: Yes, we all want to see a big number at the top of our page, but what does that number really mean? Did the Facebook ad you just ran bring in 1000 new likes that became loyal customers, or did it actually increase your like count to 1000 people that will most likely never come into your place of business? Like we said before, always remember the reason you are there… to be social. If you have a large number of followers but low engagement, are you really achieving your goal to build relationships with your customers? Don’t forget about customer service: We all know how important a business’ online reputation is nowadays, but this “don’t” goes beyond Google reviews and BBB ratings. Providing great customer service through your social media channels can do wonders for your word-of-mouth marketing just as bad customer service can hurt your business in ways that can never be fixed. Always think before you post! Do you have any dos and don’ts that you would add to the list? Share them with us in the comments below! I love your point on holding Facebook Contests. We tried to hold our first contest with an Amazon Kindle and the feedback was amazing. We never had much interaction on our posts and tweets until we used a contest through our social media channels. Awesome blog!